Create a new blank or responsive project. Add a few additional slides like content slide, custom interaction slide, or knowledge check questions. Go to the Toolbar and click Interactive Video. Here you can either add a YouTube video OR an MP4 video. 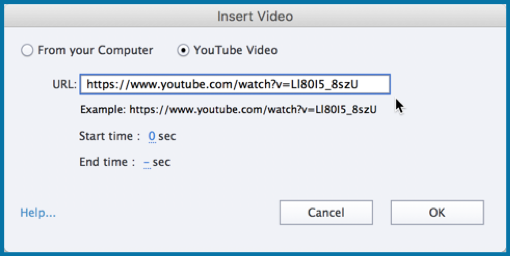 Let’s add a YouTube video here, by adding the YouTube video link in the URL field, and then click OK.
Now go to the Timeline and drag the playhead to the position where you wish to add the overlay slide. Select the slide you wish to add and click Insert. Similarly, you can go to any other position on the Timeline and add another overlay slide. 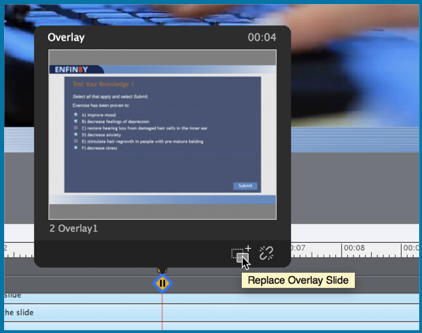 If you wish to move the position of the Overlay Slide, you can drag and drop it at any other position on the Timeline. To replace the overlay slide, hover over the Overlay marker and click the Replace Overlay Slide icon. This will open the Overlay dialog. Select any other slide and click Insert. Also, if you wish to remove the Overlay slide, hover over the Overlay marker, and then click Unlink Overlay Slide. This will remove the overlay from your video. 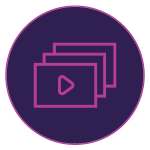 Now when you preview the project, the video will pause at the position where you have added the overlay slide and allow the learners to view or interact with the content before proceeding further. Can question slides be used as overlays and be graded? Hi @all, sorry – but i didn’t get it. 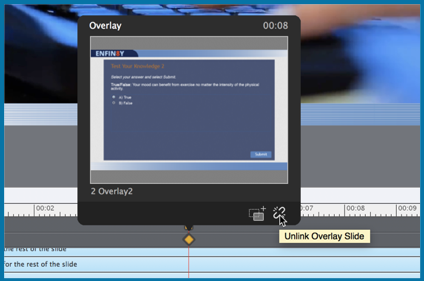 What is the difference between Interactive and Overlay? In both the insert of a question slide is not possible. It is shown in the demo video, but only normal slides can be inserted. 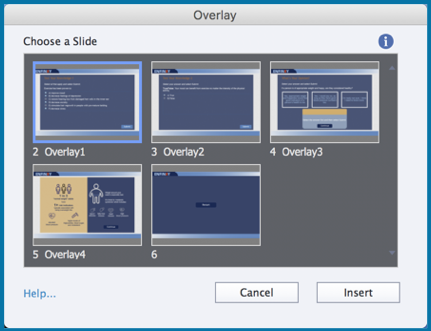 Please explain which kinds of slides can be overlay slides and which cannot. Do slides have to be “marked” as overlay slides? It appears that Question slides cannot be overlay slides. Correct?